Implementation science applied to maternal health: tobacco and alcohol use in pregnancy. Under the Researcher Links scheme offered within the Latin America Science & Innovation Fund, the British Council, will be holding a workshop on the above theme at the Institute of Hygiene, Department of Preventative Medicine, Clinical and Epidemiological Research Unit, Montevideo, Uruguay on 22 - 25 February 2016. The workshop is being coordinated by the UK Centre for Tobacco and Alcohol Studies in the UK (Professor Linda Bauld) and Professor Alicia Aleman at the Unidad de Investigacion Clinica y Epidemiolgica in Montevideo. It will have contributions from other leading researchers including Professor Fernando Althabe, Dr Laura Llambi, Professor Michael Ussher and Dr Sally Marlow. We are now inviting Early Career Researchers from the UK and Uruguay to apply to attend this workshop. All travel and accommodation expenses will be covered by the Researcher Links programme. Maternal smoking is the leading modifiable risk factor for death and morbidity among women and infants, and can negatively impact on the learning potential of newborns. Children of maternal smokers are twice as likely to smoke as adults and there is harm for children exposed to passive smoking. Maternal smoking maintains a cycle of poverty through reducing children’s ability to learn and remain healthy, ultimately limiting adults potential for entering the qualified labour market. Alcohol use in pregnancy can cause fetal alcohol spectrum disorder that include deficits related to vision, hearing, memory, attention span, learning and communication. Addressing this is a priority in the UK and also in Uruguay. Two studies surveyed women after delivery in the biggest public maternity hospital in Montevideo about prenatal alcohol consumption and measured fatty acid ethyl esters in meconium as a biomarker of alcohol consumption. 44% of 905 meconium samples were positive for alcohol consumption in one of the studies and 49% of 240 samples were positive for consumption in the other. These figures show that prenatal alcohol consumption is still a challenge in Uruguay. In 2013-14, the World Health Organisation issued guidance on both smoking and alcohol use in pregnancy (WHO, 2013, WHO, 2014). However these guidelines have not resulted in the implementation of effective interventions in a number of countries including Uruguay. One relatively under-explored avenue to addressing tobacco and alcohol use in pregnancy is to use the tools of implementation science to inform policy and practice. Implementation science aims to investigate and address major bottlenecks (e.g., social, behavioral, economic, management) that impede effective implementation of proved effective interventions, test new approaches to improve health programming, as well as determine a causal relationship between the intervention and its impact. Tools from implementation science need to be applied to reach and support pregnant women in Uruguay to engage in tobacco and alcohol cessation, and therefore improve maternal and child health. This Researcher Links workshop will be led by leading researchers and clinicians from the UK and Uruguay who are experts in research on smoking and alcohol use in pregnancy, maternal health and implementation science. Introduce maternal and child health and public health researchers from Uruguay and the UK to the principles of implementation science and understand how they are relevant to economic, health and welfare problems. Apply implementation science to the challenge of maternal smoking and alcohol use with specific reference to Uruguay. Build capacity amongst early career researchers from both countries to conduct future high quality research that will improve the implementation of effective interventions to improve maternal and child health. Establish new research links between United Kingdom and Uruguay with the potential for longer term sustainability. The workshop proposal includes sessions of exchange among participants as well as discussions of future collaboration. Those attending will have the opportunity to present and/or discuss their own work. We expect to produce by the end of the workshop a list of priorities for research to be developed as collaborative proposals. Seeking funding and supporting the development of bi-national proposals will be part of a long term joint work of coordinators, mentors and participants. Workshop Title: Implementation science applied to maternal health: tobacco and alcohol use in pregnancy. Theme: Maternal health, particularly tobacco and alcohol use in pregnancy. Clinical and Epidemiological Research Unit, Montevideo, Uruguay. The British Council have launched a new one-year programme to encourage international research collaboration between ambitious early career researchers from the UK and eighteen countries around the world. The “Researcher Links” programme, now funded under the Latin America Science & Innovation Fund, provides opportunities for early career researchers from the UK and Uruguay to interact, to learn from each other and to explore opportunities for building long-lasting research collaborations. Successful applicant organisations from the UK and Uruguay are now recruiting early career researchers and welcome applications to attend the above workshop. The workshops will provide a unique opportunity for sharing research expertise and networking. During the workshops early career researchers will have the opportunity to present their research in the form of a poster or short oral presentation and discuss this with established researchers from the UK and Uruguay. There will be a focus on building up links for future collaborations and participants selected on the basis of their research potential and ability to build longer term links. The Latin America Science & Innovation Fund, through the British Council, will cover the costs related to the participation to the workshop, including: travel (both international and local), accommodation and meals. However, participants will be responsible for making all the necessary arrangements. Participants must have travel and medical insurance. Application must be submitted before the above deadline. 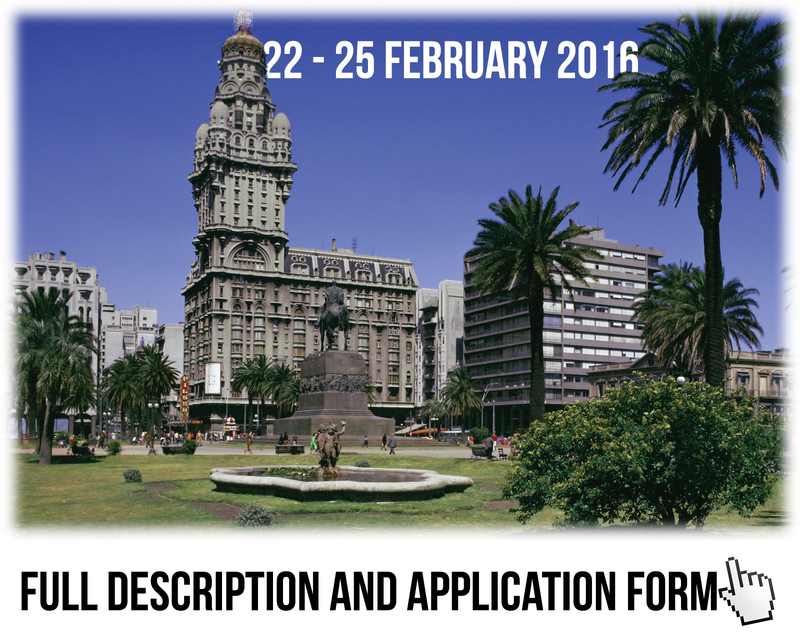 Participants must be affiliated to UK and Uruguay higher education or research institutions at the time of the application. Experience and relevance of the applicant’s research area to the workshop. Motivation and contribution to the aims of the workshop. Description of the long term impact expected through the participation in the workshop . Ability to disseminate workshop’s outcomes. The British Council is committed to equal opportunities and diversity in all its activities and this includes the avoidance of any bias in the assessment of applications due to gender, disability, racial or ethnic origin, sexual orientation, or religious belief. Participants’ selection undertaken by workshop organisers must not contravene this policy. Extra support to enable participation of early career researchers with special needs will be given.